Car drivers with limited mechanical knowledge will at least know to check and top up their oil level if reading low. Perhaps they’ve heard about engines ‘seizing up’ or even blowing up. User guides or manuals will advise changing oil periodically but what does oil really do for an engine and why is it so important? 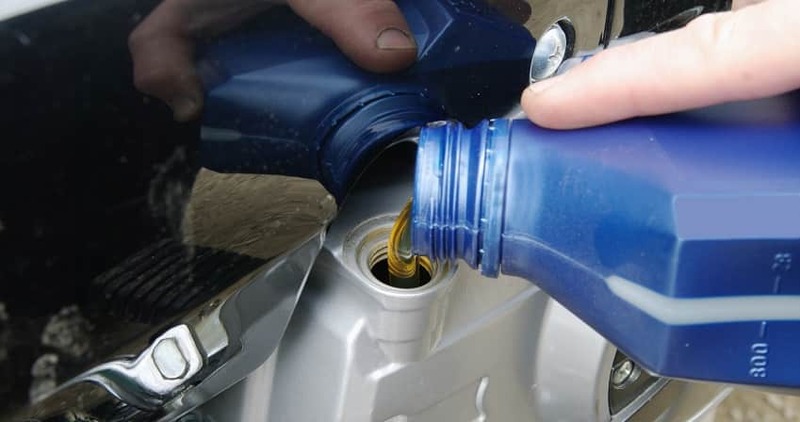 If petrol is the fuel to drive your car or motorcycle then oil is the ‘silk’ or lubricant that allows all the moving parts to function freely and smoothly. Think of trying to unlock a dry, rusty padlock. The chances are that you can’t get the key in fully or it stiffens up and won’t turn very well. A clean lock with a light coating of oil operates smoothly and without friction. 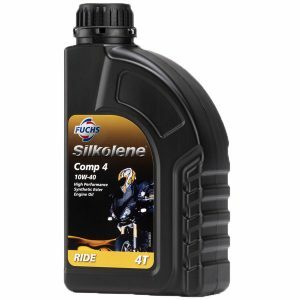 Silkolene – Comp 4 10W-40 for its all-year round reliability. Putoline Super DX4 10W-40 – Some compromises on quality but does the job at a good price point. How does motorcycle engine oil work? Motor oil lubricates moving parts by coating them with a slick film. Oil, in a way, provides a separator between metal components which avoids them wearing each other out through excessive rubbing (friction). Good clean oil maintains that function. Old, dirty, polluted and particle-ridden oil does a fraction of that job. How thick or thin, hot or cold the oil is plays an important part in the lubrication process. Think of honey versus mineral water. One moves slowly while the other runs quickly, slipping through cracks and seeping into the tiniest of parts. Engine oil’s resistance to flow is called viscosity. In the morning when your engine is cool, the viscosity of the oil is thick and is capable of producing a friction-resistant coating on surfaces. Can you read the funny figures on a bottle of oil? Choosing the right oil without experience can be confusing. With viscosity in mind you’ll need to know what you need for those wintry early morning starts. Conversely, during hot summers a different type of oil is needed. On the rack in the local petrol station you spot a 2 litre bottle of 10W-30, lets break the numbers down. The lower the number, the more thinly runs the oil. The ‘W’ designation represents the viscosity (the official SAE number) for a cold start or shall we say a winter start. The higher number indicates the viscosity level at a normal engine operating temperature tested at 100 degrees Celcius. You may ask why at starting temperatures the label only reads 10W when we know that heating the oil would make it drop further and not raise it to 30? It is the chemical composition that makes the cooler oil ‘act’ like a thinly running 10 when starting up. Don’t be too tempted by super-thin oil because at high temperatures devoid of any binding thickness it’ll be too thin to lubricate the engine. How will I know what’s right? Following the manufacturers guidelines for the climates you ride in is a good idea but now you have a little knowledge to know why. The label on the oil bottle reading ‘Mineral’ or ‘Synthetic’ relates to the main component of the oil usually representing 75% of the total. Contains all the base properties and is subject to minimal chemical treatment. It’s cheap to produce and very popular for small engine bikes and domestic motors such as lawn mowers. It is less suitable for higher performance bikes which require a lower viscosity. Mineral oil is drilled from the ground while synthetic oils are mostly created scientifically and come with a higher price tag. Mineral oil is less ‘clean’ than synthetic given that it’s a derivative of crude oil and may contain sulphur residue. These oils are also known as blends. For example 10-30% is synthetic oil and rest is mineral oil. These are pure polymer based oils developed in the labs. Both semi and full synthetic are more expensive to make than mineral oil but offer higher levels of performance and protection against engine wear. They are the main choice for high performance motorcycles. With a longer shelf life they do not degrade like mineral oils. Bottom line, synthetic oils produce less gunk and maintain a cleaner engine. Detergent/dispersant additives keep the engine clean by preventing excessive sludge accumulation. Rust and corrosion inhibitors and alkaline additives protect the engine from water and acids combustion by-products. Antioxidants are added to slow the oxidation process which may result in thickening oil and sludge formation. Anti-wear additives such as zinc dialkyl dithio phosphate (ZDDP) protect contacting metal surfaces with zinc and other compounds in case of metal to metal contact. A viscosity index improver accelerates the flow characteristics of engine oil making it work more effectively over a wider range of temperatures. How Often Do I Change Motorcycle Oil? How often you need to change your engine oil depends on whether you’re using mineral, semi-synthetic or fully synthetic oil. 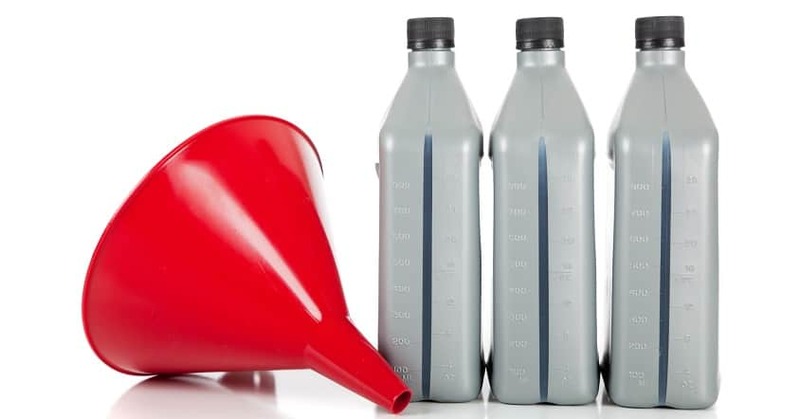 The price of synthetic engine oils compared to mineral oils is more than offset by the increased mileage and shelf life you’ll gain, not to mention the protective benefits that also reduce parts, maintenance and replacement costs. Two-stroke engines require a mix of oil in with the gas to lubricate the crankshaft, the connecting rod and the cylinder wall. They do not use fuel as efficiently as four-stroke engines, yielding less miles per gallon and emitting greater pollution. Each time a new mix of air/fuel is loaded into the combustion chamber, part of it leaks out through the exhaust port. JASO markings. What do they mean? Pitting in the gear box. Until 1998 car oils were used as the base for many motorcycle oils. As motor car technology evolved the oils that cars needed changed and additives were introduced that weren’t suitable for motorcycle engines (especially clutches and gearboxes as cars used separate oil for the gearbox). 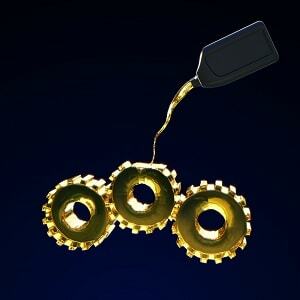 Car oils were produced using many more friction modifiers which on motorcycles may cause gearbox pitting and clutches to slip at higher revs. If you are interested in this more can be found here. Be warned it gets very technical! The long and the short of it is… use motorcycle engine oil for your bike and not car oil. 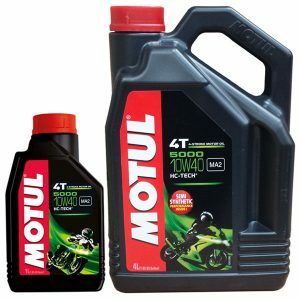 This Motul four stroke engine oil comes as a dual pack in four litre and one litre bottles. This is ideal for on and off the bike as you can carry the smaller bottle for top-up’s and keep the mother lode in the garage. It’s also easier to pour oil from a one-litre bottle than a larger one. 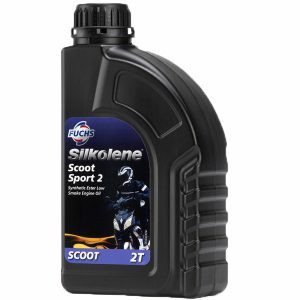 Silkolene is good all-round oil for commuters and long distance tour riders. The SAE 10W-40 viscosity range permits reliable winter and summer use with easy starting and rapid warm up. It also provides vital anti-wear protection during cold starts. Silkolene uses electrostatic forces to bond low friction molecules to stressed metal surfaces for increased power and longer term performance retention. The stay-in-grade formulation protects engines and transmissions. 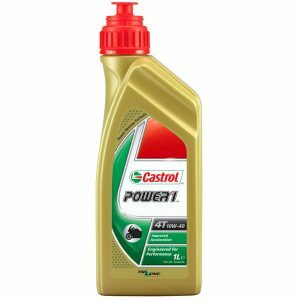 Castrol Power 1 Racing is fully synthetic 4-stroke engine oil ideally suited for sport and race replica European and Japanese motorcycle manufacturers. The oil uses the latest Trizone Technology giving optimum protection to the engine, clutch and gears under high rpm riding conditions. The manufacturer claims a greater throttle response in fast accelerations and excellent high speed oil consumption control. Check sizes against prices, the oil is available in both one litre and four litre bottles but are not sold together as standard. Putoline have produced motorcycle oils since the 1970s. 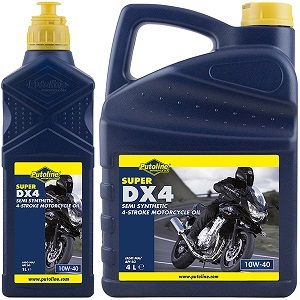 Their Super DX4 10W-40 is a low price 4-stroke semi-synthetic motorcycle oil. Meeting all standards for four stroke engines this is a reliable and popular biker’s oil. Two stroke engines may not be as environmentally friendly as many four stroke engines but the Silkoline Sport 2 oil claims a lower smoke emission rate. The advanced low smoke formula reduces engine wear while providing resistance to ring sticking, plug fouling and pre-ignition. The Silkoline Scoot Sport 2, as its name suggests, is suited to scooters and mopeds. Whilst most types of petrol are the same we cannot say that for engine oil. Don’t worry if you’re not yet an expert ‘oil analyst’. You’ll realize by now there’s rarely a ‘one oil fits all’ type. Some light research and an understanding of your bike will help you choose what’s recommended for the environment and conditions you ride in. Simply read the manual, observe the markings and descriptions on the bottle and ask the garage for their advice. … And remember to change your oil when necessary.